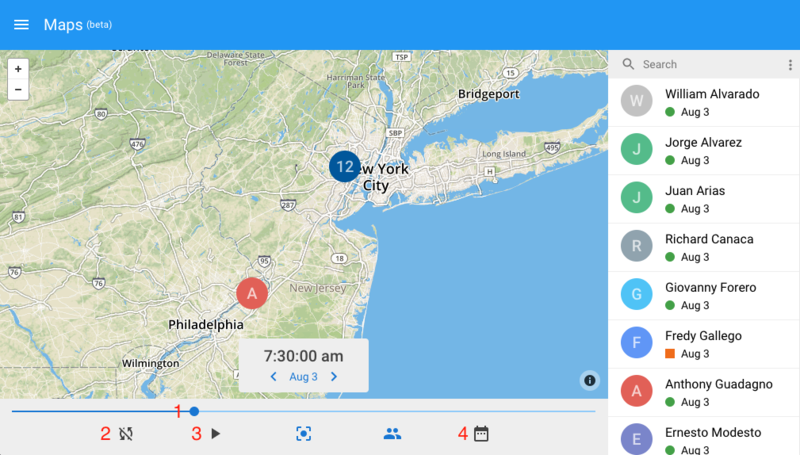 Maps combines location data from both employee Entries and device Pings, showing the most recent known location for each employee on an interactive map. The default view in Maps is the real-time, live updated map of employee locations. This view updates automatically as employees travel, showing the latest information on the map. Past information can be viewed by using the scrubber  to select a previous time in the day, or the date selector  to choose a previous date if needed, then pressing play  to playback the recorded events. The selected date and time is displayed in the bottom center of the screen. Live mode can be restored at any point by clicking on the live mode button . While only the past week of real time device locations are retained, all employee entry locations can be viewed on the map. Every employee is selected by default, but clicking on employee names in the list will single them out, allowing a more precise look into that employees history. More than one employee can be selected at a time, and all employees can be deselected at once if needed. Maps is a beta feature. It is not a finished product. As such, the feature set, capabilities, cost, and interface of Maps may change as it is further developed based on our experience and your feedback. In order for a device to record Pings, this feature must be enabled for the device in device settings.